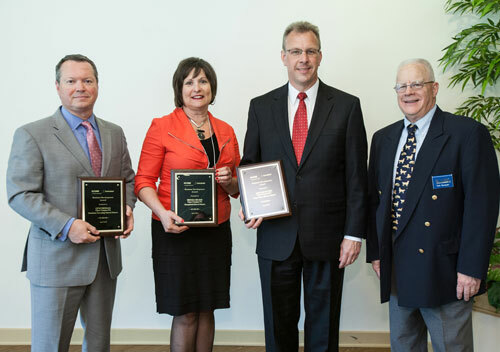 At the SCORE Lancaster Open House held on Thursday, April 25, Dr. Mike Leichliter, Penn Manor Superintendent, Dr. Brenda Becker, Hempfield Superintendent, and Dr. Gene Freeman, Manheim Township Superintendent were awarded the Lancaster SCORE Business Development Award for the Open Campus PA initiative. SCORE Lancaster has been collaborating with Open Campus PA since its inception. Retired businessman, Thomas Burgum, serves as the mentor on this project. Mr. Burgum is the Vice President of Member Services for SCORE Lancaster. Pictured from left to right: Dr. Freeman, Dr. Becker, Dr. Leichliter, and Mr. Burgum.